I've got bluetooth speakers and battery packs and wires all over my desk. I'm a slob and it's a problem. 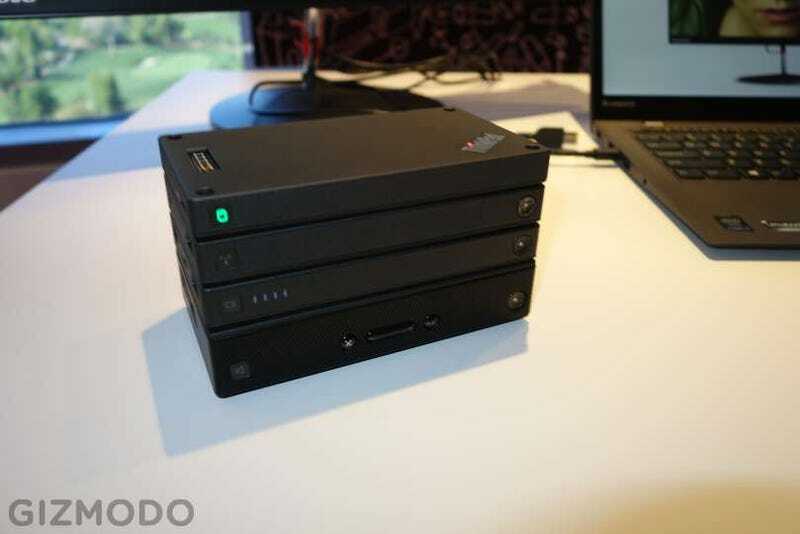 A problem that Lenovo's new Think Stack accessories look like maybe they could solve. They're like little magnetic Legos that snap all your clutter into one cube(ish thing). Stack's a line of rectangular, slab-type accessories that snap into to the titular Stack with the help of little Lego-like nubs and magnets. That way you can stack a battery pack on top of a bluetooth speaker on top of an external hard drive and only have one—dare I say handsome—monolith sitting on your desk. The different layers can snap together in any combination and in any order, so you can outfit a bluetooth speaker with a battery pack, or an external hard drive with a wireless access point. And the whole stack will charge from and pass data through a single connection, which helps minimize your rats nest of cables. At launch this April, the Stack setup will come with four different layer options: A bluetooth speaker ($90), a battery pack ($50), a wireless access point and an external hard drive ($200 as a bundle). A little on the pricey side, but neat enough that it might be worth it. Hopefully the selection will grow because these seem slick and handy; about as cool as desk organization can get.